South Korea on Tuesday announced the suspension of the annual government mobilization Ulchi exercise this year, following the suspension of the combined military drill Freedom Guardian with the US last month. The Defense Ministry and Interior Ministry said the Ulchi exercise will be incorporated with the command-post Taeguk military exercise next year. This year’s Taeguk command exercises will take place in late October in tandem with the Hoguk field training exercise, the ministries added. 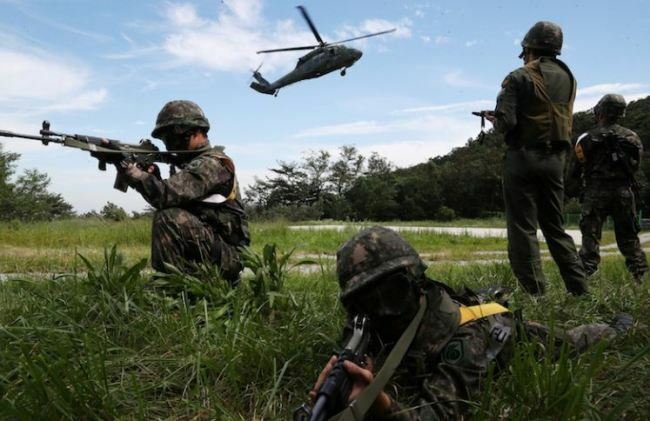 The ministries added the military will continue to carry out other regular training drills as planned, while combined exercises with the US will be decided through close consultation between Seoul and Washington. Regarding the suspension of the Ulchi exercise, Interior Minister Kim Boo-kyum said that the government reached the decision in consideration of the latest security climate and suspension of South Korea- US combined exercises. The government had conducted the Ulchi exercise every August in conjunction with the computer-simulated military exercise Freedom Guardian. The former is aimed at improving the government’s crisis management capabilities in a time of war. The government also said it will develop a new drill incorporating Ulchi and the existing Taeguk exercises. The comprehensive drill, which will be implemented next year, will include trainings for eventualities such as terrorism and natural disasters. “By applying a comprehensive concept of security, the Ulchi-Taeguk exercise is not only designed to address military attacks from outside, but to deal with terrorism and a large-scale natural disaster,” Interior Minister Kim said. Following the decision to suspend the Freedom Guardian exercise last month, the government had been considering a plan to halt the Ulchi exercise. Cheong Wa Dae has said the exercise could either be suspended or changed in terms of training program. Suspension of the joint military drills is often viewed as a way to assuage North Korea’s concerns over its regime security in return for abandoning nukes. North Korea has accused the joint drill of being a dress rehearsal for an invasion even though the allies’ insisted that it was defensive in nature. Involving tens of thousands of troops from the US and South Korea, the Ulchi Freedom Guardian exercise includes computer simulations carried out in a large bunker south of Seoul, intended to check the allies’ readiness to repel aggression by North Korea.